What is calcification of shoulder and bones? Calcification of shoulder and bones, affects nearly every fifth person older than twenty years. The causes of pain in the tendon or joints can be numerous, among them is inflammation, or tendon rupture, joint arthritis and the like. One of the causes may be the deposit of calcium in the tendons, and most often it occurs in the tendons of the rotator cuff in the shoulder. However, calcification in the shoulder is not necessarily accompanied by a strong pain and difficulty in mobility of this major joint. How calcification of shoulders is dangerous, why it causes pain, while the other goes completely pain-free and what treatment methods are commonly used; find out below. The cause of calcification is not known - it is believed that trauma does not affect the deposition of calcium, and that systemic diseases also plays no role in it. When a person feels pain, which may be accompanied by difficulty in mobility of the joint, they should see a doctor to determine what is causing these problems. Sometimes even the X-ray finds that there is a deposit of calcium in the tendons, but it does not automatically mean that the calcification in the shoulder is causing problems. The pain can be caused by other processes in the joints or soft tissue because calcification goes through the usual four phases that may not be accompanied by any symptoms. What if the symptoms do appear? If the calcification of shoulder occurs with pain then adequate measures need to be taken. Suppose also that the calcification is divided into degenerative and reactive ones. Degenerative calcification rarely causes pain and usually has only an incidental finding on an X-ray. They occur as parts of a completely natural process of tissue repair, when at the point of fibre rapture calcium starts to repair the existing damage, but a greater reason for concern is reactive calcification. It is characterized by much more serious problems, a medicine calls them Calcifying Tendons and they go four phases. In this stage for unknown reasons, there is a greater accumulation of calcium in an altered tendon. At this stage of bone calcification pain occurs in a smaller or slightly higher intensity. Calcification of the shoulder or another joint at this stage is stationary, and pain does not even have to occur, but in spite of everything there be small restrictions in the movement of joints. When calcification of shoulders comes into this phase, then there are inflammatory reaction of its surrounding tissue with a gradual reabsorbing of calcification. This phase is followed by a very powerful, intense pain. Calcification in the shoulder at this stage is already absorbed, tendons heal and problems simply pass. The duration of the said phase varies but it is important to note that if the calcification of shoulder is diagnosed, treatment is definitely necessary. Only the timely treatment can reduce pain, and remediate problems that will bring back the mobility of the joint. What methods are used against calcification of shoulder? After a thorough clinical examination, a specialist instructs the patient on the mandatory x-ray and ultrasound, which first confirms the existence of calcifications in the soft tissues. Although the principle of treatment is very similar, calcification of shoulder may require a certain intensity of the applied therapy, and it is in the first place implemented to alleviate the symptoms and improve the mobility of the joint. Affected patients usually feel that it would be best if a modern method could simply remove calcification. However, breaking the calcification in the shoulder is in practice very difficult, and often completely unnecessary, because the desired result is missing. 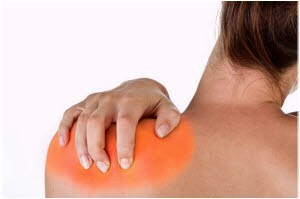 If the calcification of shoulder is well underway, the first step in treatment would be physical therapy. It involves the use of physical agents, which among others include ultrasound, magnetic therapy, laser and electrotherapy. Exercises for the shoulder, that is kinetic therapy is also an extremely important part of the treatment. In the so-called Calcifying Tendons therapy out of physical agents commonly used are lasers and ultrasound, because they reduce pain and decrease inflammation. Physical therapy often leads to a significant reduction of symptoms, and sometimes to the complete disappearance of calcification in the shoulder, but in addition you can use the so-called "blocking" drugs. These are the corticosteroids, which are injected via injection directly into the place of pain, to shoulder affected by calcification to keep under control the pain. Previously used was popular X-radiation therapy, a complex surgical intervention, and drug therapy if the physical therapy is not successful. Calcification of shoulder and bones, recently can be treated with sound waves -ESWT (shock wave therapy) and this is a relatively new method. Focused sound waves are used, usually in cases of failure of physical therapy. The effectiveness of this therapy confirms the complete disappearance of calcification on the control tape. Sound waves, which split binding barrier, significantly increase the elasticity of the tissue and changes the very texture of the skin, while the calcification in the shoulder is crushed by a similar principle, as in breaking up kidney stones. Although calcification of shoulders occurs frequently, therapy is very effective in removing calcifications in the elbow, heels, hips and knees. Acoustic shock waves are effective in the fight against cellulite. However, their use is avoided on the head, spine and near the large blood vessels and nerves. Unlike lasers and ultrasound, calcification of shoulder is much faster treated with sound waves, and the result is visible already after two or three months after the therapy, because that is the length of calcification absorption. This method of treatment is painless and very short, there is a small and above all rare number of contraindications. Calcification of shoulder involves the use of quick, short-term, individual fluctuations of acoustic or sound energy. In addition to breaks calcification in the shoulder without the use of additional medication, therapy with acoustic shock-wave fosters the formation new capillary networks and blood vessels, which further supports the healing phase. How long is the treatment and who cannot use it? Duration of treatment is not always the same, and that depends on the localization of calcification. So you must first do a detailed diagnosis before applying these methods because the strength of shock waves depends on it. Treatment of heel spur, for example, takes three to ten treatments, while the shoulder calcification takes an average of seven treatments. The treatment is carried out twice a week and can be repeated after three months, in this there are groups of patients that therapy with acoustic shock waves is strongly discouraged. These include children up to 18 years, patients with blood coagulation disorders (haemophilia A and B, von Willebrand's disease), as well as those who are affected by a variety of inflammation or tumours, because therapy with acoustic shock waves could worsen the current situation. On the other hand, when it comes to the treatment of calcification in children, you should be careful in the selection of therapy, because the application of certain therapeutic methods has not been tested enough, or they are not applied in the zones of growth. What to do after therapy? The application of sound waves does not require special preparation of the patient but the review of a specialist in physical medicine is certainly obliged. In addition to the review, the doctor will make a diagnosis based on X-ray, on the basis of which he/she will determine whether there is calcification of the shoulder or not. It is also necessary for every suffering person to individually determine which form of therapy will be most efficient. After the treatment and elimination of problems, it is essential that patients continue to exercise regularly and do targeted exercises, in order to strengthen the muscles and relieve the strain on the joints, in order for calcification of the shoulder not to reappear.